I love the atmosphere, great job ! I feel like this is a screenshot from an animated movie! Beautiful work! The anatomy of the face and muzzle look especially realistic and well-drawn. The fur lineart looks sharp and fluffy, and the legs convey an active pose and sense of motion. The sharp contrast between highlights and shadows in the fur creates an excellent sort of depth and contour. Wonderful work! Thank you much for such a detailed comment! I really appreciate it! I feel the spirit to this! Do you drain your inspiration from your own countrys nature? At least it looks so! Yes, that's pretty much true. I gain inspiration from my forest walks, and I would love to be able to transfer the atmosphere of life of Nature into my drawings. 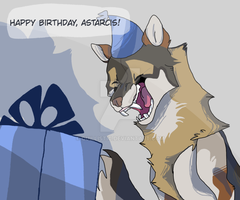 What is your favourite season, Astarcis? It’s hard to say. Every season has it’s own charm. I like the summer that is cheerful and full of life, I like the winter that is calm and silent. I like the luxurious dress of early autumn, as well I like the melancholic mood of it’s end. Nature is always beautiful. Wow, that's descriptive, exactly what I think of these seasons! The background is absolutely amazing!!! And the wolf is wonderful!! !